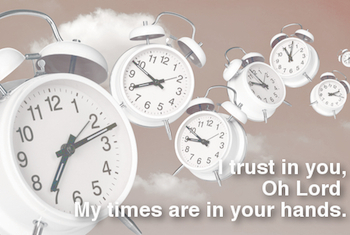 Your times are in My hands, says the Lord. Yes, I order every step. I know the way that you take. Your future is in My hands, and I have good plans for you. I Am involved in the totality of your life, and every moment is important to Me, because you are important to Me, says the Lord. Trust that there is nothing too big or too small for me to take notice of. I Am the way maker. I created time and placed you in it precisely where I wanted you to be! You are positioned where I purposed for such a time as this. Do not fret over the signs of the times. I have them in My control. Trust that I who have taken care of you in the past Am able to take care of you now and always. Did you think that I made a mistake in My placement of you? Your purpose in My Kingdom is unfolding and I am unveiling the very specifics to you a little at a time. You do not have to see the whole picture. If you did, then you would not have to trust me, says the Lord. It is faith in Me that will bring you into your destiny in Me. It is believing when you cannot see! It is trusting in Me to be your provisional God in all things at all times. Would I place you and leave you there without substance? You would not do that to your child, would you? I Am a God of detail, and I do not leave anything out. Nothing is overlooked when it comes to the supply of your need. Just walk with Me. Never mind what others do. Don’t bother to look back to see if they are following. Keep looking ahead. The past is not your placement. History does not have to repeat itself in your life unless you want to walk backwards, says the Lord. Never mind what you could have done. Forget what you should have done. Think about what you are doing today and where I Am leading you. It is a forward movement and regrets are not on the table. Forgive yourself and MOVE ON, says the Lord. I desire you to forgive others as well. YOU ARE FORGIVEN because of My finished work of the cross. Let your mind be at ease as you accept the challenge of a NEW DAY in ME! You know that I am calling you to press on to the prize of the mark of the high calling in Me. No one has the right to disqualify you. YOU BELONG TO ME ALONE, and I Am the only one that gives you authorization. I say, YES! Press forward, for your destiny lies ahead, and as you forget those things that are behind and keep looking at the things that are before, you will see that you will be well on your way!